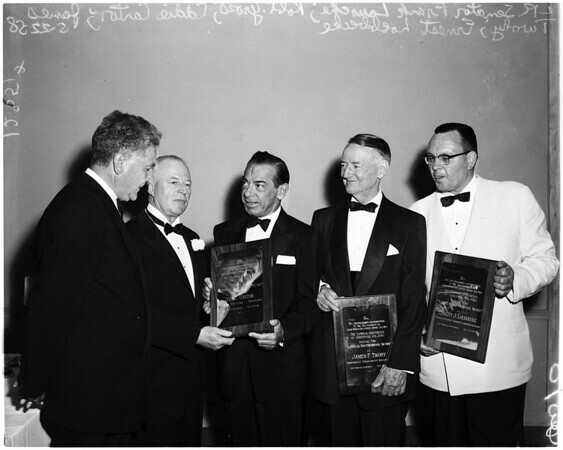 Supplementary material reads: "#13-#3-#4 L to R - Eddie Cantor, James F. Twohy, Ernest J. Loebbecke & Robert E. Gross, who presented Bronze National Brotherhood Awards to others at Beverly-Hilton. Dinner was 10th annual Brotherhood Testimonial Affair of National Conference of Christians & Jews, Inc. Eddie Cantor. #14 L to R - U.S. Senator Frank J. Lausche, main speaker, Robert E. Gross, dinner chairman, & those who received bronze National Brotherhood Awards, Eddie Cantor, James F. Twohy, & Ernest J. Loebbecke. At Beverly-Hilton".